Faber-Castell Polychromos has long been my go-to for traditional (non-water-soluble) colored pencils. 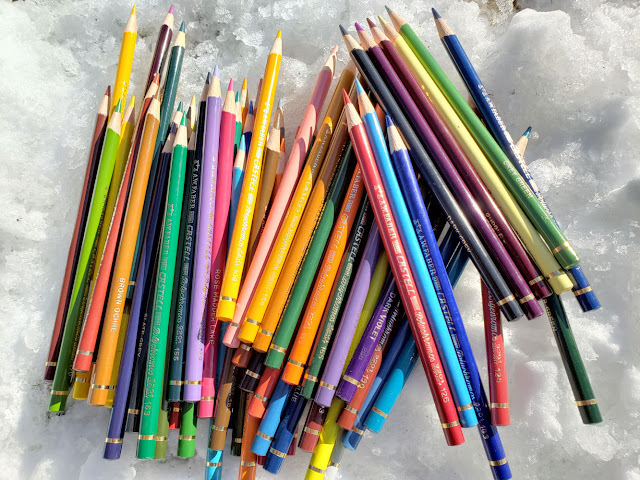 Harder than most artist-grade pencils, oil-based Polychromos has proven to be an excellent balance between softness (for easier application) and firmness (for crisp details) for most of my needs. Barely used at all, the set is missing only one pencil, and none was sharpened past production sharpening. 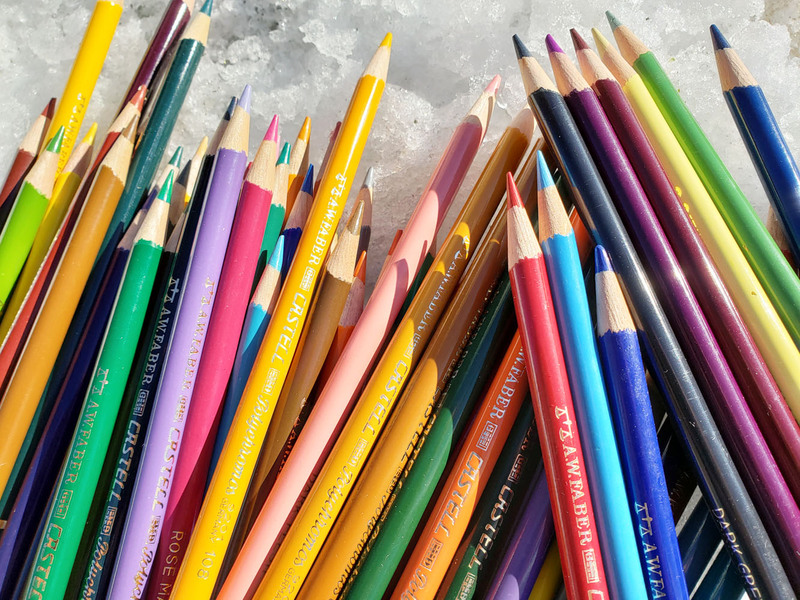 (Photos show pencils after being freshly sharpened by me.) I was told by the eBay vendor that this set was used by her aunt in the early ‘60s. (I love it when the eBay vendor knows a product’s provenance! So often, vendors simply buy out estate sales and are clueless of a product’s age, and often I know more about the product than they do. But I always ask anyway, and occasionally the information provided is historically useful.) 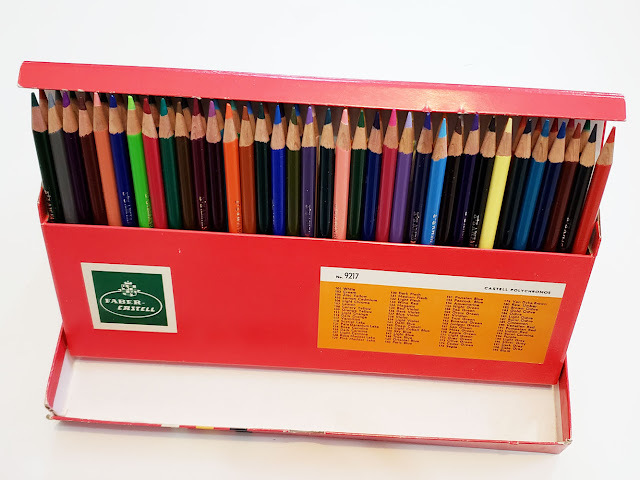 The pencils are in such beautiful condition that I think they spent most of their lives in their box. The box, too, is in good condition, and opens to form an easel. Alas, its design is useless – the flap on top is too stiff to fold back, so it obstructs pencil removal. (I took all the pencils out, finally liberating them to live productive lives). The box forms an easel. Unfortunately, the top flap makes the box unuseable. Before I get further into this review, here’s a bit of visual history. 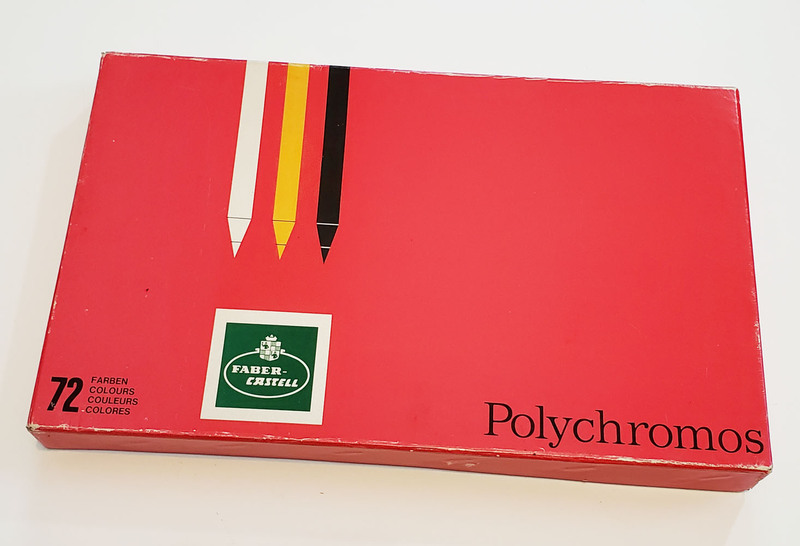 Although this is the first set I’ve found, I’ve managed to acquire a few random single Polychromos pencils. 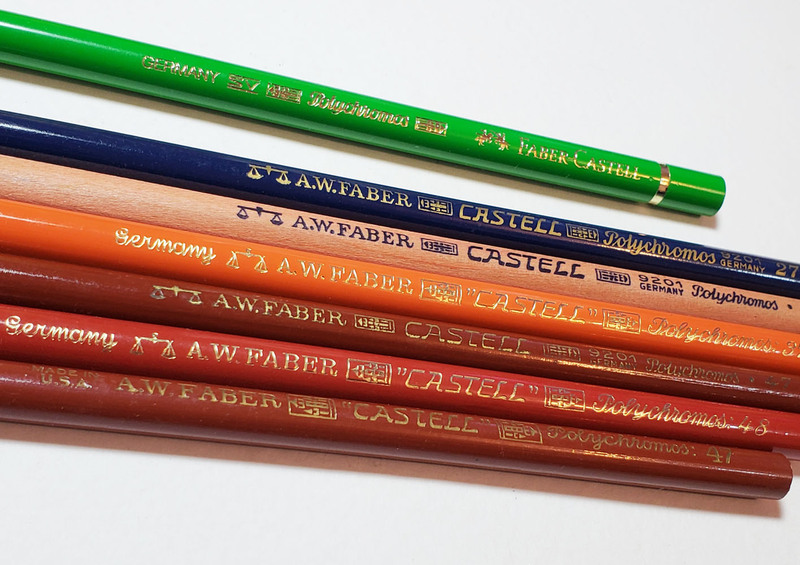 Shown here are six A. W. Faber Polychromos (the bright green at the top is a contemporary one for comparison). Interestingly, the bottom one is made in the USA; all the rest are made in Germany, as is my contemporary set and the vintage set I’m reviewing. The old Polychromos have unfinished ends; contemporary ones have a rounded end cap with a gold band. 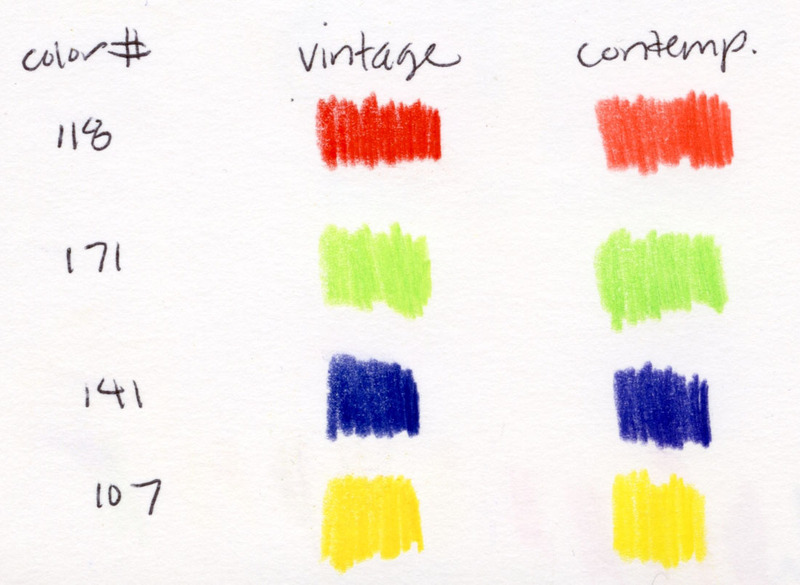 Top green pencil is contemporary; others are vintage. Vintage pencils have plain, unfinished ends. The vintage set I’m reviewing is probably not as old as those singles, based on the design, which is almost identical to my contemporary set: The round, glossy barrel is finished with a rounded end cap and a gold band. 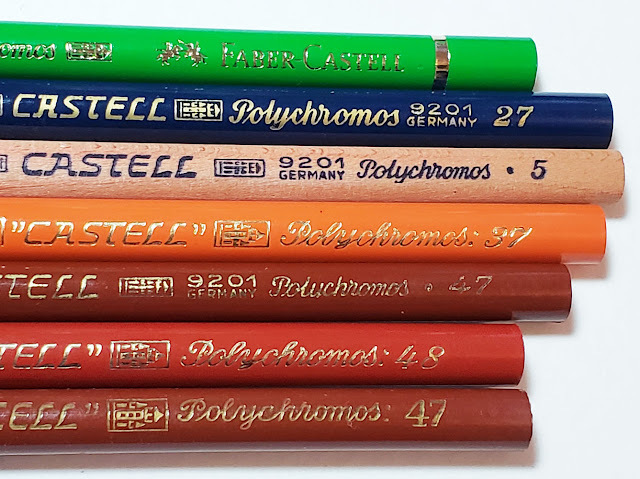 Vintage Polychromos from the set I'm reviewing. Branded A.W. Faber, the old pencils do not bear the “jousting knights” logo that appears on contemporary pencils – a logo that was adopted when the company began using the name Faber-Castell (according to Wikipedia). In my exploration of vintage colored pencils, and especially when I’ve been able to compare older ones with contemporary ones of the same brand, I’ve almost always come to the same conclusion: Newer pencils are better, at least in terms of pigment quality – and as long as pencil manufacturing has remained in the company’s country. 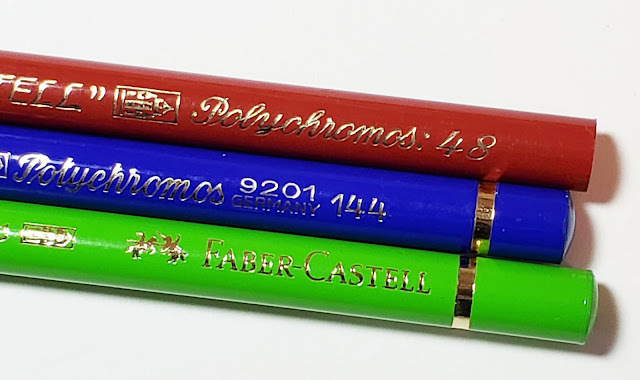 It’s only natural that as production technology improves and discoveries are made about pigments and binders, pencil quality would improve, too. 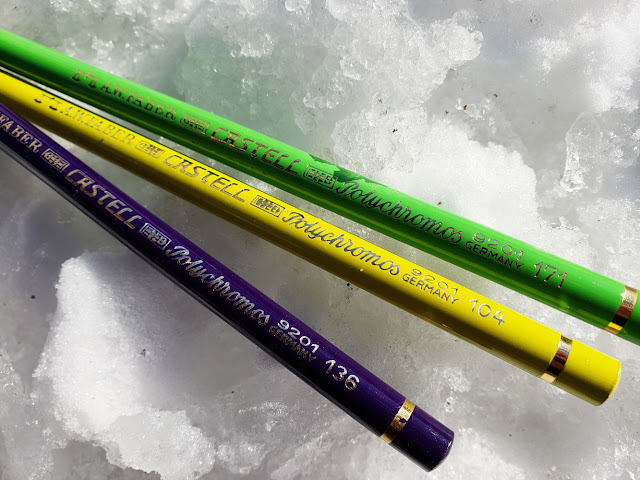 So it was with some trepidation that I made swatches of the 71 colors: It would be heartbreaking if this lovely set were of inferior quality compared to the contemporary Polychromos pencils that I love! 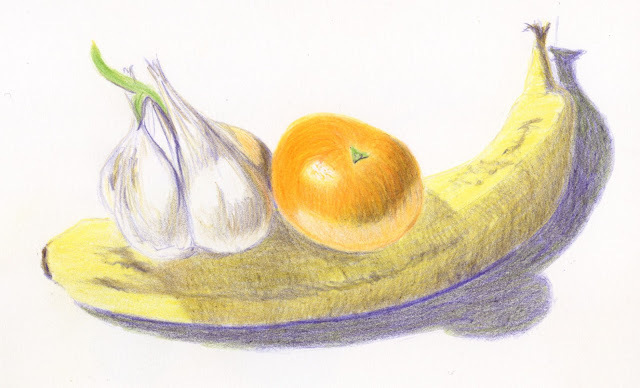 Making the sketch of the garlic, satsuma and banana, the vintage pencils are every bit as good as their modern sisters. It’s always a pleasure to find a well-preserved specimen of colored pencil history that I can also enjoy using. Nothing like a pile of colored pencils to warm a frigid day!